Outhwaite playground renewal needs your input! Please come along to our April 9th meeting and have your say about the renewal of the Outhwaite Park playground. As many of you already know, the Outhwaite Park playground has been scheduled for renewal. It was agreed in Council that the design would need to be agreed with the local board. 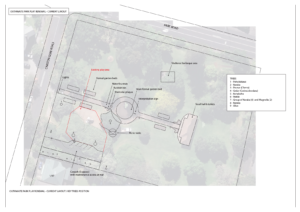 The renewal was discussed in a workshop with the board in November 2017 which identified that the project would be to review improved connections, assess the safe interface between the car park and play area. The design needed to be open and safe and reflect the heritage formalism of the park. The project manager is working to establish the layout of the playground as per the draft concept below. Once this is established then the play content can be developed. 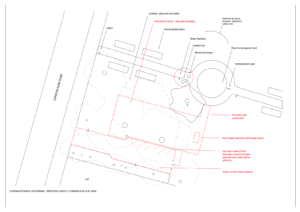 The proposed layout of the playground in Outhwaite Park. The elements of the playground itself have not been decided, and your opportunity for input happens on April 9th. Bring the kids if you must! Our regularly scheduled meeting will start at 7pm sharp with this being the first item on the agenda, so that those with children/family to attend to can get away when they’ve had their say. The playground at Outhwaite has been mentioned frequently during our Grafton Vision consultation, so there is a lot of interest in the future of the space. Our Grafton Vision project continues. If you or your community group would like to take part, please drop Rick and email at chair@grafton.org.nz. Our meetings are held in the community hall at the Liberal Catholic Church at the corner of Claremont and Carlton Gore Road.